The so-called basset clarinet, i.e., a soprano clarinet with the lower range extended to written C (or B; see below) is now almost universally recognized as the correct instrument for performance of the Mozart Concerto K622, Quintet K581 and the late operas. 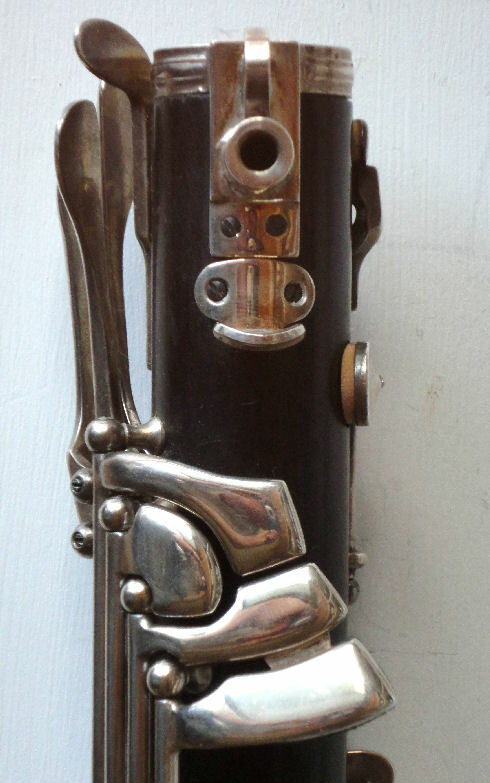 (3) A complete basset clarinet may be ordered. Each option produces a functionally similar instrument, with no differences in tuning or other playing qualities. 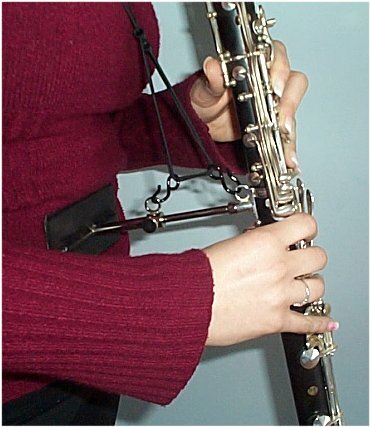 Converting a conventional clarinet to basset status is the simplest, quickest and most economical route. 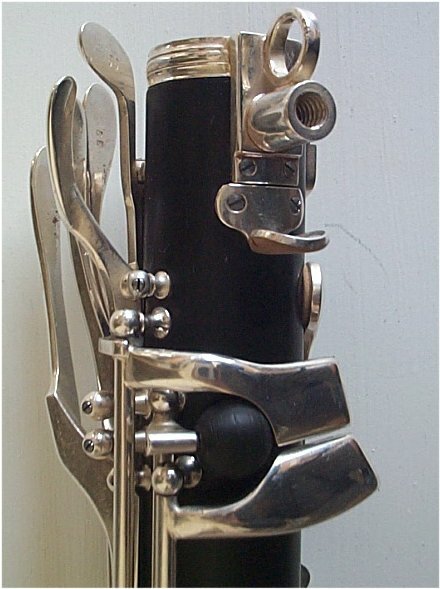 Regrettably, because of the flared lower joint bore of the French clarinet, it is not practical to make a removable basset section that could simply be added to a clarinet without modification. While most basset clarinets are in the key of A (for the Mozart Concerto and Quintet), a number have also been made in Bb (for use in Mozart operas, particularly the aria Parto, parto from Tito) and C (especially useful for opera orchestra work). 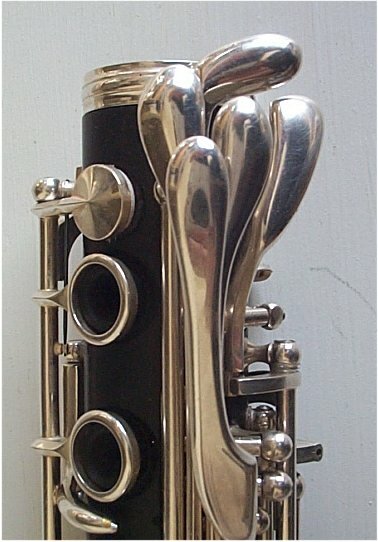 Though basset clarinets offered by other makers have C as the lowest note, current research (click here for information) indicates that low B may have been used by Mozart. Thus a range to B is offered as an option, either integral with the basset joint or as a removable section. Standard keywork has the low Eb key for the right hand little finger, and three right thumb keys for D, C#, C (and a fourth for B, if fitted); the touchpieces are shaped to allow very easy transitions between notes. A popular option is a low D key for the left hand little finger, in addition to the thumb key; also available is a key for the right hand little finger, producing either low D or C#, or convertible for both. An alternate Ab/Eb lever for the left hand is recommended, and ordered by most customers. For some thoughts on the basset key arrangement, click here. While it has been customary for the lowest note on basset clarinets and basset horns to be low C, recent informed speculation has pointed out the desirability of having bottom B natural available, for at least a couple of passages in the Mozart Concerto (1st mvt. bar 295 and 3rd mvt. bar 147). That this is more than just idle guesswork is supported by the existence of a few early 19th century basset horns with range to B, including one (described on this site) which is identical in form to what is believed to be Anton Stadler's basset clarinet.